A new study of ocean warming has just been published in Geophysical Research Letters by Balmaseda, Trenberth, and Källén (2013). There are several important conclusions which can be drawn from this paper. As suspected, much of the ‘missing heat’ Kevin Trenberth previously talked abouthas been found in the deep oceans. Consistent with the results of Nuccitelli et al. (2012), this study finds that 30% of the ocean warming over the past decade has occurred in the deeper oceans below 700 meters, which they note is unprecedented over at least the past half century. The main results of the study are illustrated in its Figure 1. 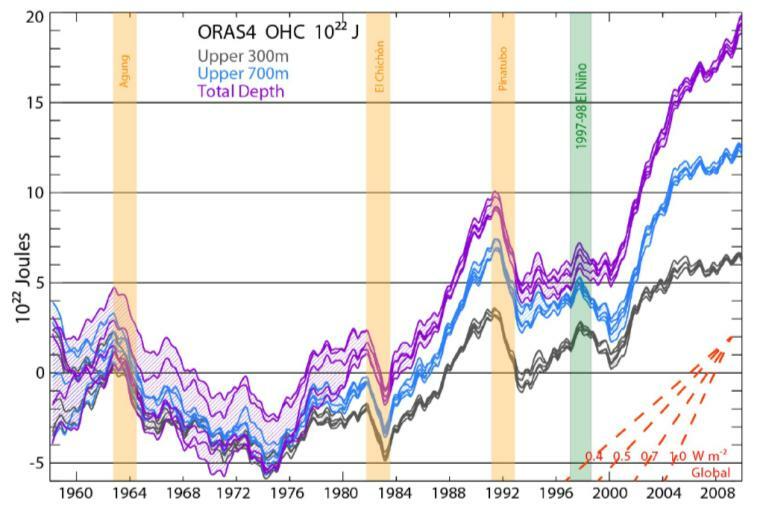 Figure 1: Ocean Heat Content from 0 to 300 meters (grey), 700 m (blue), and total depth (violet) from ORAS4, as represented by its 5 ensemble members. The time series show monthly anomalies smoothed with a 12-month running mean, with respect to the 1958–1965 base period. Hatching extends over the range of the ensemble members and hence the spread gives a measure of the uncertainty as represented by ORAS4 (which does not cover all sources of uncertainty). The vertical colored bars indicate a two year interval following the volcanic eruptions with a 6 month lead (owing to the 12-month running mean), and the 1997–98 El Niño event again with 6 months on either side. On lower right, the linear slope for a set of global heating rates (W/m2) is given. As illustrated in Figure 1 above, the study divides ocean warming into three layers for comparison – the uppermost 300 meters (grey), 700 meters (blue), and the full ocean depth (violet). After each of the Mt. Agung, Chichón, and Pinatubo volcanic eruptions (which cause short-term cooling by blocking sunlight), a distinct ocean cooling event is observed in the data. Additionally, after the very strong El Niño event of 1998, a cooling of the upper 300 and 700 meters of oceans is visible as a result of heat being transfered from the surface ocean to the atmosphere. The warming of the oceans below 700 meters has also been identified by Levitus et al. (2012) and Von Schuckmann & Le Traon (2011), for example. Kevin Trenberth past comments about ‘missing heat’ drew considerable attention. The phrase refers to the fact that the heat accumulation on Earth since about 2004 (e.g. from warming oceans, air, and land, and melting ice) that instruments were able to measure could not account for the amount of global heat accumulation we expected to see, based on the energy imbalance caused by the increased greenhouse effect, as measured by satellites at the top of the Earth’s atmosphere. So what’s causing this transfer of heat to the deeper ocean layers? The authors suggest that it is a result of changes in winds related to the negative phase of the Pacific Decadal Oscillation and more frequent La Niña events. Recently there have been some studies and comments by a few climate scientists that based on the slowed global surface warming over the past decade, estimates of the Earth’s overall equilibrium climate sensitivity may be a bit too high. However, as we previously discussed, these studies and comments tend to neglect the warming of the deep oceans below 700 meters. So the slowed warming at the surface is only temporary, and consistent with the ‘hiatus decades’ described by Meehl et al. (2011). The global warming end result will be the same, but the pattern of surface warming over time may be different than we expect. So what it the real truth here? the real truth is that Pachuari was misquoted. that’s how its done. If you cite Monckton as a source here, you set yourself up for ridicule. And I’d suggest you stop drinking bilge water and touting it as tea. You have the gall to cite the infamously fraudulent Lord Monkton and Anthony Watts? John Vance you are either a fawn, a fool or a fraud. Which is it? Everyone has an opinion, and to each their own…John Vance is uneducated, has no qualifications having left school early many, many years ago. Do check out his “professional” website and discern for yourself the “evidence based” research and style. To be educated and still get it wrong is being a fool…. If you know so much about me, why have you not bothered to find the truth? My site is not professional as its a gathering of many facts you will readily dismiss due to your prejudice. The emperor’s clothes type syndrome? Plus NASA, y’know rocket scientists, telling us the data shows 2010 was the hottest year on record tied with 20-5 and 2011-2 the hottest la Nina yera and all that. * “I like ice also as an indicator of climate change for its political neutrality. – Dr Henry Pollack, geophysicist, University of Michigan. Source : The ‘Watts Up with Sea Ice?” Youtube video by Greenman3610, at the 1 minute 14 secs to 1 minute 51 seconds mark. The original article seems protected by a plutocratic pay wall. That’s when billionaires make money from publicly funded research. But I am not surprised; all studies here and there in recent years showed extremely deep warming, including CH4 eruption, deep down. I have talked on my site of that article in Science where CH4 bubbles were actually photographed, but the authors soothingly concluded not to worry, as they were re-absorbed before they made it to the surface! The iceshields can catastrophically melt from below, and they will, if the ocean warms in depth (as it does). surface freezing can hide the process. In general, notice that if the icecaps start to go, they will not be back for thousands of years, or as long as the CO2 stays high (CO2 is worse than most radioactive waste as far as persistence!). There are actually NO way to eliminate CO2 from the atmosphere, with EXISTING technology usable on a VAST scale. The only plausible mechanism (freeze the CO2 out) would require first to develop cheap and reliable thermonuclear fusion. An ironical quandary. We may as well go for fusion first. So, how much time do we have ?